Anyone who knows me knows how much TV I watch. A LOT. Staying up very late as a kid fostered my love of all things TV. During the normal season(s), I watch a ton of shows, and usually the summer time meant that I would be able to take a break and catch up on anything I missed during the season. Not so much anymore. Many networks are now following the formula set by TNT and others. Shorter seasons, almost by half. For the summer and winter periods. The following are shows I think you should be watching. Basically, if I am watching them, you should be too. I promise, I won’t lead you astray. 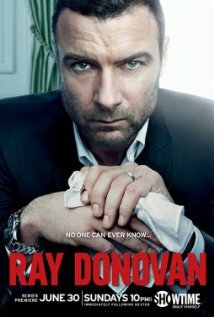 #10 – Ray Donovan: Showtime. Starring Liev Schreiber and John Voigt – This is a great show about a fixer of celebrity problems in LA. I like to call him the Olivia Pope of the West Coast. Liev plays a great anti-hero. And John Voigt is the perfect antagonist to the titular character. A must watch. #9 – Hell on Wheels: AMC. Starring Anson Mount, Common, and Chris Heyerdahl – Once a soldier and slave owner, this show follows the lead character, Cullen Bohannan as he becomes the overseer of the building of the Transcontinental Railroad in the 1860’s. It’s a riveting story of how the prosperous nature of the East Coast meets the brutal backdrop of the Wild West. #8 – Magic City: Starz. Starring Jeffrey Dean Morgan – Follows the life of a hotel owner in the 1950’s, Miami Beach. Mobsters abound, how does a man keep control of his hotel empire with the mob/union nipping at his heels? #7 – Hemlock Grove: Netflix. Starring Famke Janssen. – One word. WEREWOLVES. and other stuff too, but if I say what it is, it’ll ruin one of the final reveals of the show. The werewolf transformation alone should get you stoked to put this on your eyespace, but if you need any help deciding to watch this or not, I’ll say this…. Eli Roth. kthxbye. #6 – Suits: USA. Starring Gabriel Macht and Gina Torres – Lawyers. Good looking lawyers. Smart and funny lawyers that will charm your pants off. And a really good story arc as well. Gabriel Macht pulls off smarmy with such grace, it makes you love to hate him. OR, just love him. And Gina Torres works so well with Macht, you would think they have worked for years and years together. The cohesiveness of the whole cast is pretty darn amazing. #4 – Falling Skies: TNT. Starring Noah Wylie and Will Patton. Now in it’s third season, Falling Skies has found it’s place. Don’t get me wrong, but the first two seasons of this alien-invasion themed show was good. But now, the actors have settled into their roles and the show is moving at breakneck speed. Which is what I like in a show. Noah Wylie and Will Patton are just the tip of the iceberg when it comes to the stellar casting of this show. How do we treat each other when the world as we know it comes to an end? Watch to find out! 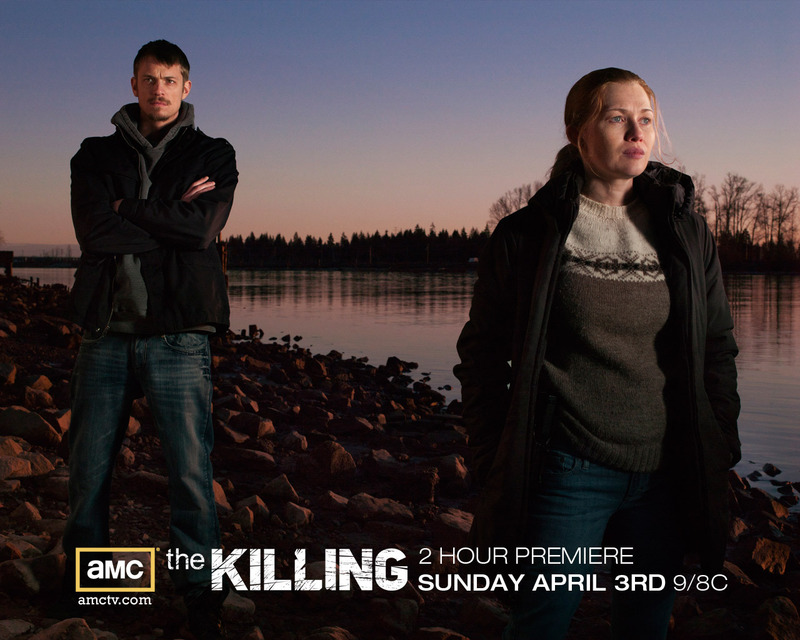 #3 – The Killing: AMC. Starring Mireille Enos and Joel Kinnaman. This show follows a couple of detectives charged with solving the murder of a young girl. This show isn’t pretty. This show is gritty and it’s real, and it sometimes makes you feel uneasy. Everything that happens in this show, could happen in your neighborhood. But it also shows that there are heroes right around the corner, and these heroes aren’t perfect. Enos and Kinnaman bring such a realness to this show, its not the story that drives me to watch, its their portrayal of the characters. 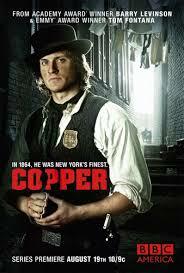 #2 – Copper: BBC(America). Starring Tom Weston-Jones. (Taken from IMDB) Set in the Five Points neighborhood of New York City in the 1860s, focusing on a rugged young Irish cop who is forced to navigate his unruly and dangerous immigrant neighborhood while interacting with the uptown Manhattan crowd and the black community. This show is brutal, in your face, and gives insight on a time that hasn’t really been put on screen in this way before. Watch it, you will not be disappointed. Superb acting and great set pieces make the show worthwhile! 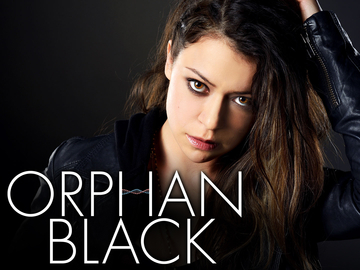 #1 – Orphan Black: BBC(America). Starring Tatiana Maslany, Taitana Maslany, and Tatiana Maslany – I don’t know where to begin about this show, but all I can say is that I have been a fan since Day 1. There hasn’t been another show on air where the main actress of the show has played 6 characters. SIX. I mean, who does that? And Tatiana Maslany pulls it off with such ease, it makes you wonder…well, maybe she has twin playing the other parts. But no, it’s all her. And let’s not get started on the sci-fi element to the shot. But the Oscar buzz has now begun and she has already won awards for her performance on this show. Don’t miss out!! Honorable Mention: Continuum(SyFy), Franklin & Bash(TNT), Under the Dome(ABC), Rizzoli and Isles(TNT), Graceland(USA), Covert Affairs(USA), Teen Wolf(MTV), Dexter(SHOTIME), and Banshee(Starz). Welp, there you have it. I still have yet to figure out how I have time to watch all of these (and then some). Welcome to my world. Grab a seat and enjoy! Just a dude from NoVA..... Talkin comics, movies, tv, and whatever else.. Not an expert by any means....just talking about what I love. Posted on July 16, 2013, in Action & Adventure, Awesome, BBC America, MTV, Netflix, San Diego Comic Con, Sci-Fi, SDCC, Showtime, Starz, SyFy, TV Shows, Uncategorized, USA TV and tagged ABC, AMC, Angie Harmon, Anson Mount, bbc america, Breckin Meyer, Common, Continuum, Copper, Covert Affairs, Danny Huston, Defiance, Falling Skies, Famke Janssen, Franklin & Bash, Gabriel Macht, Gina Torres, Graceland, Grant Bowler, Hell on Wheels, Hemlock Grove, Jeffrey Dean Morgan, Joel Kinnaman, John Voigt, Liev Schreiber, Magic City, Mark Paul Gosselaar, Mike Tveit, Mireille Enos, MTV, Netflix, Noah Wylie, orphan black, Piper Perabo, Rachel Nichols, Ray Donovan, Rizzoli & Isles, San Diego Comic Con, sdcc, SHOWTIME, Suits, tatiana maslany, Teen Wolf, The Killing, TNT, Tom Weston-Jones, Under the Dome, USA, Will Patton. Bookmark the permalink. 2 Comments. Thanks for finally writing about >10 Summer Shows You Should Be Watching (plus honorable mention) | nerdysomethin’s Blog <Loved it!